What Does A Cache Look Like? TIME: The War Cannot Be Lost! As you know I am not a very political person. I just wanted to pass along that Senator Obama came to Bagram Afghanistan for about an hour on his visit to ' The War Zone ' . I wanted to share with you what happened. He got off the plane and got into a bullet proof vehicle, got to the area to meet with the Major General (2 Star) who is the commander here at Bagram. As the Soldiers where lined up to shake his hand, he blew them off and didn't say a word as he went into the conference room to meet the General. As he finished, the vehicles took him to the ClamShell (pretty much a big top tent that military personnel can play basketball or work out in with weights) so he could take his publicity pictures playing basketball. He again shunned the opportunity to talk to Soldiers to thank them for their service. So really he was just here to make a showing for the Americans back home that he is their candidate for President. I think that if you are going to make an effort to come all the way over here you would thank those that are providing the freedom that they are providing for you. I swear we got more thanks from the NBA Basketball Players or the Dallas Cowboy Cheerleaders than from one of the Senators, who wants to be the President of the United States . I just don't understand how anyone would want him to be our Commander-and-Chief. It was almost that he was scared to be around those that provide the freedom for him and our great country. If this is blunt and to the point I am sorry but I wanted you all to know what kind of caliber of person he really is. What you see in the news is all fake. 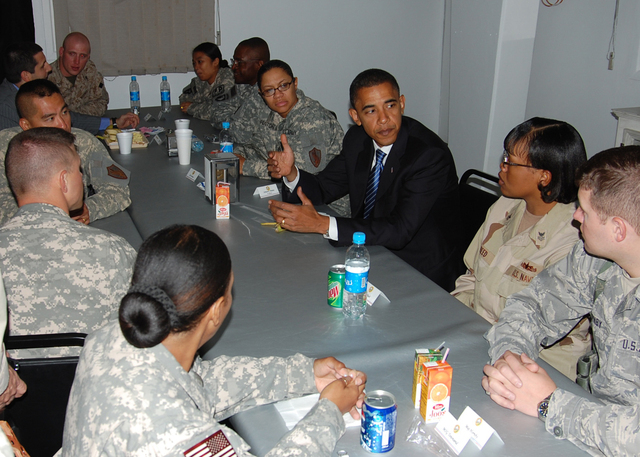 Update: Below is a report from the PAO in Camp Eggers, Afghanistan, about the visit of Senator Barak Obama. US Army Central Command Photo of Senator Obama meeting with troops at Camp Eggers, Afghanistan. KABUL, Afghanistan – Camp Eggers service members enjoyed breakfast with a Congressional delegation including Senators Barack Obama, D-Ill., Jack Reed, D-R.I. and Chuck Hagel, R-Neb. during their visit, July 20, to Combined Security Transition Command-Afghanistan headquarters. The visit was part of the delegation’s trip to American forces commands in central and eastern Afghanistan. In Kabul the delegation was briefed by Gen. David McKiernan, International Security Assistance Force commanding general, and Gen. Maj. Gen. Robert Cone, CSTC-A commanding general. Throughout their stops at Bagram and Jalalabad Air Fields and in Kabul, the senators met with service members from their respective states.